October Big Game: Bolt Action! October 1st is WW2 Bolt Action Day. I’m hoping to play something from September 1944 – in the vicinity of Hell’s Highway as a prompt. As I know there are some of you less interested in WW2, we’ll also have SAGA on hand with a small competition there. Bids for either game please to me by 29th SEPT in order to ensure we’ve got scenario and players matched. If you want to bring your own figures please let me know , preferably with list of troops available. The rules will be basic Bolt Action but with some local arrangements to cover movement of units (particularly those in vehicles or not yet in contact). These can be found here. Author NeilPosted on September 18, 2016 November 12, 2017 Leave a comment on October Big Game: Bolt Action! Photos: September Big Game: Trawlers! A small selection from September’s big game of the 1970s Cod Wars can be found on Flickr. Thanks to Stephen Etheridge for organising what was a fun days gaming that saw the Icelandic Coast Guard come away with the victory, or should that be, the least damaged public rating. Apparently the Royal Navy are still holding the enquiry in to how one of their warships not only rammed and heavily damaged another of their fleet, causing it to have to return to port, but also managed to ram and sink one of the British trawler fleet! Not a great day for the British all told. Author NeilPosted on September 17, 2016 November 11, 2017 Leave a comment on Photos: September Big Game: Trawlers! So September’s “happening” will be a 20th century asymmetric naval engagement over three small sea areas. 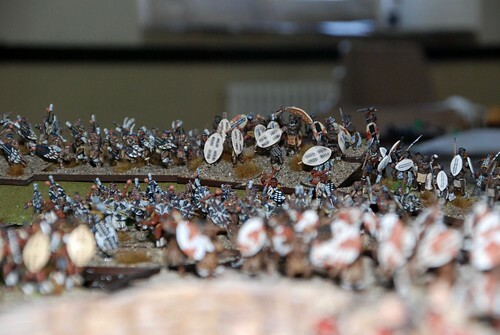 As befits such, one side will be heavily outnumbered – but I promise they will have the most fun and have every chance of meeting their victory conditions while their “lumbering” opponent will have everything to lose! There will be no need for preparatory movement or organisation, the game will be easily contained in the space of one day, shorter depending on the restraint of certain parties…… There will be little map movement in this scenario (mainly just book-keeping) and the scenario will heavily favour good “ship drivers” and people with crystal balls (now that did not come out as intended). There should be plenty of opportunity for participation as the scenario demands one participant – one ship to emphasise the “driving” aspects of the game! Smelly Arran or Fair Isle jumpers are optional for the day. Things are complicated by a number of political dimensions – both sides need to be seen to be whiter than persil and International Maritime Law will be upheld at all times (sort of……). Also the court of International Opinion will deduct points for perceived bullying of smaller nations, reckless endangerment, bad accents, etc. If all goes to plan, we will be using ship models/counters that are currently being “3d printed” specifically for the game – yes I know it’s a shock to go to such lengths for an AWI game, but I did study CSG at Uni some 34 years ago and this is the first time I have ever used it in anger, or apathy! For more about this unusual naval conflict, see this post from David Manley and this article on Wikipedia. Author NeilPosted on September 1, 2016 November 11, 2017 Leave a comment on September Big Game: Trawlers! Much later than originally intended, this is just a quick post to point out the photos from August’s big game – Zulus! – can be found on Flickr at https://flic.kr/s/aHskEFqDtg. It was hoped that Major H. Flashman would be able to provide an account of the battle, but it appears he is still in shock having barely escaped the massacre with his, and the regiment’s, valuables intact!